So, just like the previous weekend I headed down to visit my folks this past Sunday and, en route, did some birding. For some reason I couldn’t get excited about the birds I was seeing. Maybe I birded too much this weekend, maybe I’m just too stressed about moving next weekend, and maybe I need my head examined because I did get some pretty good looks at some pretty cool birds. My first stop was Coxsackie, or, more specifically, the Coxsackie Creek Grassland Preserve. 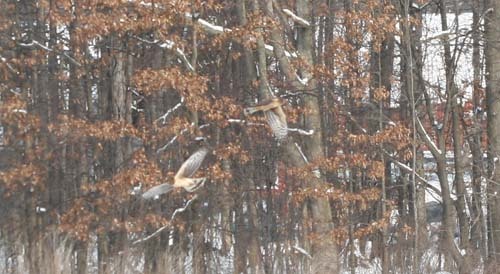 As is expected at the grasslands in winter raptors stole the show. I couldn’t find the Northern Shrike that Will saw Saturday but I did see plenty of birds that make their living by killing and eating. 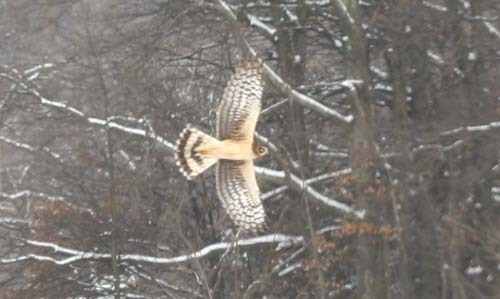 A female Northern Harrier was the first bird I spotted and she put on quite a show. She quartered the field, flying slowly, intently looking for breakfast and repeatedly plunging into the weeds after rodents. I watched and photographed her for at least five minutes. Then a second harrier flew in and chased the first off, and, heck, even when they are slightly out of focus two harriers are always better than one! After the harrier show I scanned the grasslands for a bit through my bins, finding a pair of Red-tailed Hawks perched in a tree and another female Northern Harrier on the ground. I continued scanning without finding anything and when I took my bins from my eyes I was amazed to see a dark-form Rough-legged Hawk fly by within 100 meters. I quickly got the bins back up and focused and watched it until it was barely distinguishable from the distant tree-line. Other than a couple other common birds like Blue Jays, Downy and Red-bellied Woodpeckers, and a honk-a-ree-ing Red-winged Blackbird I didn’t see anything else so I headed down to the Coxsackie Boat Launch on the Hudson River to see if anything was happening there. The yawning Ring-billed Gull above pretty much sums up what the birding was like at the Coxsackie Boat Launch. Other than a horde of Canada Geese and a couple of distant Common Mergansers the boat launch was devoid of bird life. Even the usually reliable Eastern Bluebirds that feed on berries there were absent. The rest of the ride to visit my folks was pretty slow, though I did peer into a couple of back yards in Catskill where I’ve learned there are decent feeder arrays and also spotted some waterfowl on the Catskill Creek. 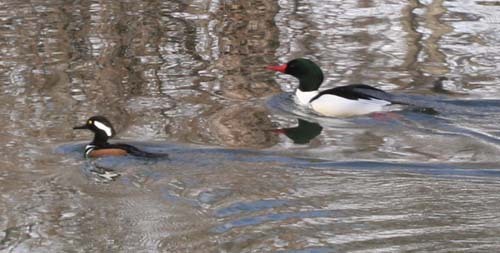 I was even lucky enough to catch this shot of drake Hooded and Common Mergansers participating in a synchronized swimming competition. I’ll miss the weekend country drives through the upstate terrain but I won’t miss filling my gas tank. Bring on New York City! I’m ready to get my Anti-Global Warming Big Year going again! I have discovered a love for photography in the past year and especially for taking photos of birds. Your instruction is going to be a help for sure. If you have a moment sometime come look at the photos I have taken of different birds. 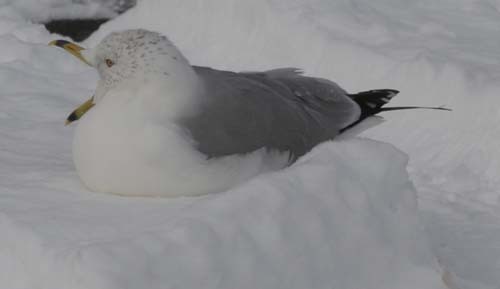 Some of the photos are of birds in captivity. The owl for instance is down at the Virginia Beach Aquarium facility. But others are not. Does it seem an important distinction to you? I took a photo of two geese heading towards the sun at dawn and parts of them seem positively orange. Is that the reflection of the sun? Amazing. How many birds are killed by windmills and other green energy projects?